The Silencer MkIII balances the needs of enthusiasts and professionals by combining a powerful single 12V rail and premium grade capacitors. But the Silencers secret weapon is its ultra quite operation. This is a very straightforward, reliable power supply. It is virtually silent, ond has been in one system the past few years. Has 20 4 motherboard connector, 4 pin cpu power, 6 pin gpu power, 6 molex connectors, 3 sata power connectors. Great for a budget system or compact server. Condition is Used. Shipped with USPS Priority Mail. Unit has been tested working onsite! Unit has wear from previous use including scuffs and scratches. Quantity listing with reference photo, you may not receive the actual item pictured. Comes as shown in images. Ready to ship! . This is from my PC and still works great. Good Working Condition. No Power Cord. Item is warranted to be as specified in the above details, and in good working order (unless stated that it's condition is unknown). No software are included with any systems. Silencer MkIII 400w Fully Modular Computer Power Supply and Cooling . Condition is New. Shipped with USPS Priority Mail. This is a great gaming power supply. This unit has powered my rig for the last year and a half. This unit is a great replacement or upgrade for anyone looking to get more power. This unit was used moderately for about 6 months and has been sitting in my rig. Recently it’s been tough to find time for gaming. So I’ve decided to sell this unit in hopes that someone we’ll be able to use it for their rig. Let me know if you have questions or if you’d like to see other photos. When I originally purchased this item it was priced at $149.99. Powerful single 12V rail (62A). Super-clean DC output. One of the most sought after and highly regarded quality power supplies. High efficiency (88%). Model Number: PPCMK3S600. Manufacturer SILENCER. The unit underwent full testing, and passed tests for key functions. It is R2/Reasdy for Resale. We will be happy to assist you. Tested for key functions, R2/Ready for Resale. Model Number: PPCS760. The Actual item(s) shown in the picture(s)! Condition: Used Working Pull! checkout before your order will be cancelled. The order cannot be combined or modified after checkout has been completed. PC Power & Cooling Silencer 610 EPS12V Power Supply. Condition is Used. One / Original Owner. Tested and Working (see pic). Shipped with USPS Priority Mail. It is open box, and in new condition. Has These Connectors 1 - 24 pin to motherboard plus extra 4 pin if needed. Excellent condition was bought new and used for bout 3 months before i added more drives and had to upgrade to the 900 watt model. Condition: Used Tested Working Pull ! checkout before your order will be cancelled. The order cannot be combined or modified after checkout has been completed. Puerto Rico or Virgin Islands. This one was tested in tower just prior to pulling it. Power Supply was pulled from a working environment. Power supply has wear from previous use including scuffs and scratches. Includes unit only. Photos of actual item for sale. Unit is on hand and ready to ship. Please feel free to message us any question you may have. Thank you for checking out our listing. .
ATX 24/20 Pin x1. 80 PLUS Efficiency. Power overview. Cables and Peripherals. MPN: PPCMK3S400. Model: Silencer MK III 3. Most printers go to the refurbishing process after the order is made. Also you will find all the parts that you may need for your computer, laptop from motherboards to power supplies. Part Num: S75QB. MPN: S75QB. Manufacturer: OCZ Tech. Category: Power Supplies / Power Protection. QA Certified! Connect our fullymodular connectors and forget about connectivity issues for life. What’s Inside: The Silencer® architecture balances the needs of enthusiasts and professionals by combining a powerful single 12V rail, 100% Japanese 105°C capacitors, continuous output at a demanding 50°C ambient temperature, and heavy-duty protection circuitries. Silencer Mk II. PC Power and Cooling. Maximum Power. SATA Power Connector. 80 PLUS SILVER Certified. 1 x 12V(P4). 1 x Main connector (20 4Pin). 5.9" x 3.4" x 6.3". 1x 8 pin CPU power. 1x 4 pin CPU power. PRE OWNED. AS SHOWN, NO POWER CORD. 1x 6 2 pin GPU power. 1x 6 pin GPU power. Looks good. In case you placed order I will cancel it without notice. 80 Plus Platinum. 135mm ball-bearing fan, for whisper quiet operation. Eliminate wire clutter by using our semi modular cables. Ease of installation. 120mm ball bearing fan varies RPM by load and temperature for whisper quiet operation. 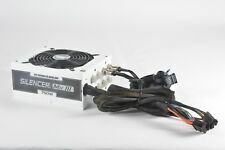 pc power cooling silencer 950w Watt PSU 80 Plus Silver. Condition is Used. Shipped with USPS Priority Mail. Selling my computer due to a new kiddo arriving. Check out my other auctions! Connect our fully modular connectors and forget about connectivity issues for life. One of the lowest well regulated electrical noise and ripple on the market. With 6 x 6 2 PCI E connectors it is Multiple GPU Ready. Connect our fully modular connectors and forget about connectivity issues for life. One of the lowest well regulated electrical noise and ripple on the market. With 8x 6 2 PCI E connectors it is Multiple GPU Ready. Its only been used for a couple weeks. Perfect condition. Do not have the original packaging, but I do have the installation booklet. For your consideration: a USED Power & Cooling PSU. Not modular and quite big and messy so beware if you have anything smaller than an full ATX tower. A little dusty. Connect our fullymodularconnectors and forget about connectivity issues for life.What’s Inside:The Silencer® architecture balances the needs of enthusiasts and professionals by combining a powerfulsingle 12V rail, 100% Japanese 105°C capacitors, continuous output at a demanding 50°C ambienttemperature, and heavy-duty protection circuitries. The Silencer MkIII balances the needs of enthusiasts professionals by combining a powerful single 12V rail premium grade capacitors. But the Silencers secret weapon is its ultra quite operation. 80Plus Gold.